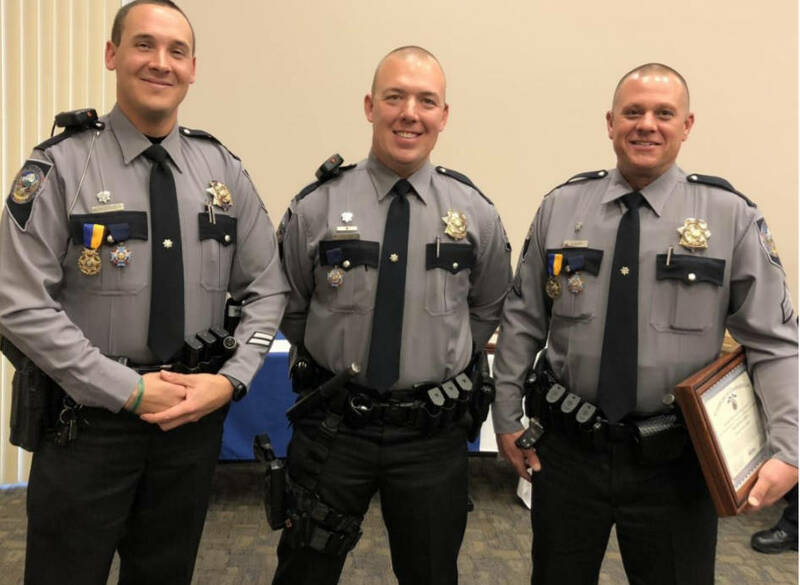 Nevada Highway Patrol Troopers were awarded commendations and medals for their heroic actions during the mass shooting event this past Oct. 1 in Las Vegas. Special to the Pahrump Valley Times Eight troopers were awarded commendations for their response efforts to the shooting and two troopers were awarded the Medal of Valor and Life Saving Medal and one trooper was awarded the Life Saving Medal. Special to the Pahrump Valley Times If a member of the public sees a Nevada Highway Patrol Trooper wearing the new ribbon it signifies that trooper had direct involvement in the Oct. 1 mass shooting. Special to the Pahrump Valley Times Trooper Adam Whitmarsh, Trooper Jacob Fisher and Sgt. Shawn Eckert were among those honored at the recent ceremony. 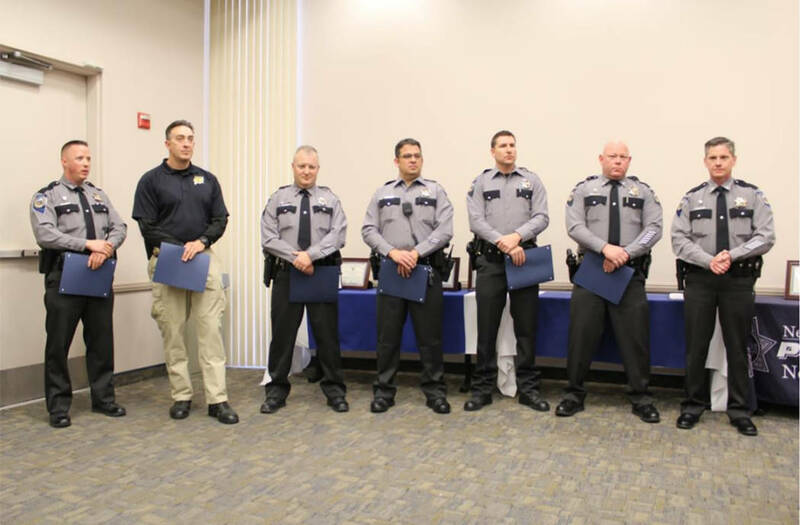 Eight troopers were awarded commendations for their response efforts to the shooting and two troopers were awarded the Medal of Valor and Life Saving Medal and one trooper was awarded the Life Saving Medal. Sgt. Shawn Eckert awarded the Medal of Valor and Life Saving Medal. Trooper Adam Whitmarsh was awarded the Medal of Valor and Life Saving Medal. Trooper Jacob Fisher awarded the Life Saving Medal. The awards were presented Feb. 28. The Nevada Highway Patrol created a new uniform ribbon that is authorized for wear on the duty uniform if that trooper was directly involved with the response effort of Oct 1. In all, 68 Nevada Highway Patrol troopers are authorized to wear the newly-created ribbon on their duty uniform effective immediately. 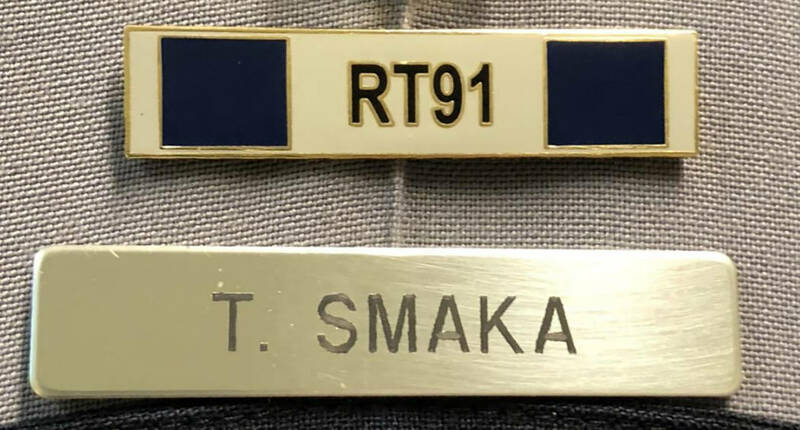 If a member of the public sees a Nevada Highway Patrol Trooper wearing the new ribbon it signifies that trooper had direct involvement in the Oct. 1 mass shooting. A total of 58 people were killed and more than 400 others injured when Stephen Paddock sprayed bullets on concertgoers from his 32nd-floor suite at nearby Mandalay Bay.